Our phones aren’t merely devices we use to call the people we like (and some folks that we don’t). They’ve become life partners. We take them with us everywhere, even places we would never take the people we love. We cuddle up with them abt night and start our days with their company. But this relationship isn’t one of pure affection. Our phones serve us—they’re personal assistants. Apple’s Siri was the first explicit digital assistant to break into the mainstream. She’s not available on Android, but you may find the options here even better. 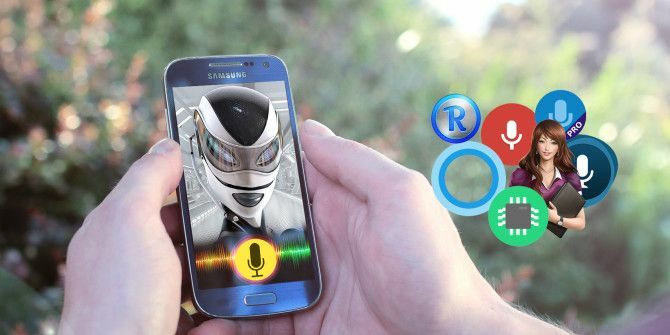 So what’s the best Siri alternative for Android? Here are our favorites. Gmail users, Android owners, and YouTube watchers have given Google plenty of data over the years. Google Now was a feature that used this data to surface information before you knew you wanted it. Google Now sent out suggestions based on your search history, what you watched, and what went through your inbox. Now there’s Google Assistant, the evolution of Google Now. Google Assistant communicates with you in a more conversational manner, similar to Siri. But with all the information Google has, you may like Assistant’s responses even more than Siri’s Google Assistant vs. Apple Siri: Which Is the Best Smart AI? Google Assistant vs. Apple Siri: Which Is the Best Smart AI? Siri may have been the pioneering voice assistant on a smartphone, but it’s been years since most of us took her seriously. Are other voice assistants simply better? Let's take a look. Read More . Google Assistant now comes as part of most Android phones. You can access it by holding the home button or, on some devices, squeezing your phone by its sides. The Google Pixelbook even comes with a dedicated Google Assistant button. As you might expect, Assistant can make calendar appointments and answer questions. But with it, Google is trying to expand our idea of what digital personal assistants can do. At this year’s Google I/O conference, the company introduced the ability for your phone to place calls and make reservations on your behalf. If you just want a functional Siri equivalent that likely came with your phone, then look no further. Here’s our more in-depth guide to what Google Assistant can do. Apple has Siri; Android has Google Assistant. Microsoft figured that Windows Phone needed something, so it came out with Cortana. But the company didn’t stop there. It later released versions for Android and iOS. Cross-platform availability is possibly Cortana’s biggest appeal compared to Google Assistant Google Assistant vs. Cortana: Which Digital Voice Assistant Is Better? Google Assistant vs. Cortana: Which Digital Voice Assistant Is Better? Is Google Assistant or Cortana better? We tested these digital voice assistants to find which is better at reminders, music, smart home integration, and more. Read More . The Halo-inspired personal assistant is baked into Windows 10. One benefit of this is being able to send a text message from your laptop when you miss a call on your phone. You can also talk to your PC the same way you talk to your smartphone or tablet. This cross-platform synchronization really is the main reason to install Cortana on your phone. If you already interact with her on your PC and Xbox, why not keep the experience consistent? Cortana also plays nice with Amazon Echo devices. But if you’re into Amazon’s ecosystem and not Microsoft’s, you may want to skip to the next item on the list. Years ago, Amazon seemed like an unlikely name to associate with digital assistants. Its only widely known consumer products were Kindles. But the company’s Echo smart speakers have caught on, making Alexa a household name throughout the world. The Android app can stream a playlist, tell you the weather, read off news headlines, and tell you a joke, just like the smart speakers. If you have smart home products integrated with Amazon’s ecosystem, then the Alexa app offers a good way to control it all. The app also grants access to Alexa’s vast library of skills 18 Awesome New Amazon Alexa Skills You Need to Try 18 Awesome New Amazon Alexa Skills You Need to Try The Amazon Echo's list of skills is growing all the time. Let's take a look at the most useful and silliest skills from the past few months. Read More . You don’t need an Amazon Echo speaker or other smart home gadgets to pick Alexa as your favorite Siri app for Android, but that’s the biggest reason to do so. Lyra, formerly known as Indigo, first appeared as a cross-platform Siri alternative in 2013. The ability to continue a conversation with Lyra across multiple devices is still one of the assistant’s main features. If you log in on your computer or install the mobile app, Lyra will pick up the conversation regardless of where you are. You can then interact with it in over 70 languages. The Lyra app has a simple appearance that nudges you along, with suggestions about the kinds of commands Lyra can understand. You can read the news, translate speech, and listen to music all inside the app. While the Lyra app appears basic, the experience is tied to an online service. You will need to create an account to start using the app. Maybe you’re not particularly excited about sharing your information with the companies behind personal assistants Do Siri, Cortana & Google Now Need Too Much Personal Data? Do Siri, Cortana & Google Now Need Too Much Personal Data? Read More . I understand. Fortunately, there are other options from smaller developers. Looking for Siri-style snark? Robin’s developers have deliberately tried to make an app that feels like a challenger to Apple’s digital assistant. That makes it worth a look for people who are less interested in finding an alternative to Siri and want to find the same experience for Android. That’s not to say Robin is a copy. Robin is more of a driving assistant than a way to surface information. Think of Robin as a friend riding shotgun that looks up information and does tasks for you while your hands are on the wheel. Maybe you want something with that corporate feel, but without the privacy concerns associated with using a personal assistant made by a company that already knows so much about you. Dragon Mobile Assistant comes from Nuance, the makers of some pretty impressive voice dictation software for PCs and mobile devices. This might be the option that hits the right spot between mega-corporation and a hobbyist tinkering around. Dragon Mobile Assistant responds to the phrase “Hello Dragon.” It’s not particularly conversational, but provides the answers to basic questions about the weather and general facts, such as the height of Mount Everest. You can use it to send email and posts to social networks, which both draw on one of the app’s biggest strengths. Dragon uses its own voice dictation engine rather than Google’s, so you may find this assistant does a better job of picking up your voice. If that’s the case, you have the option to have Dragon listen for your commands at all times, even when the screen is off. Some of these apps look outdated. Others look modern but still somewhat out of place. By comparison, Smart Voice Assistant should look right at home next to the other apps you’ve been running since Android Lollipop. Smart Voice Assistant isn’t a ready-to-go solution right from the beginning. First, you go through the list of features you can activate via voice commands and assign your own custom keywords. You also assign names to contacts and particular phone numbers. This can feel tedious at first, but when you’re done, you know exactly what your system can do. Since the app runs in the background, you can then issue these commands anytime. You can fully dictate texts and have the Smart Voice Assistant read back the responses if, for example, you need to keep your eyes on the road. Smart Voice Assistant is a bit of a one-man effort, so it doesn’t feel quite as polished as the better-funded or more established projects. But the app is easy on the eyes, and it’s sure to appeal to users who wants more control over their experience. Which Siri Alternative Is Right for You? We each have our own preferences and needs. Out of the box, Google Assistant works pretty well, but maybe you want to use the same personal assistant on both Android and Windows. In that case, maybe Cortana’s the choice for you. Those of us who aren’t comfortable with giving these companies more information may find Robin, Dragon Mobile Assistant, or another smaller app worth considering. If you have a Samsung device, you can try using Bixby What Is Bixby? And How Do You Use It? What Is Bixby? And How Do You Use It? If you have a Samsung phone, check out everything Bixby can do. Here's a look at its most useful features. Read More on it too. Explore more about: Alexa, Google Assistant, Microsoft Cortana, Siri, Virtual Assistant, Voice Commands.